I`m yet to come across a person who does not like bhel puri. Last evening, on my way to Mumbai airport, I could not resist the temptation of a plate of it. Already a fairly healthy snack, bhel puri can be made healthier by avoiding the fried papdis and reducing the sev sprinkled on top. 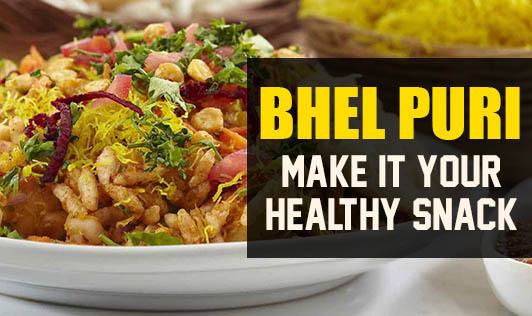 What makes bhel puri a healthy snack? The puffed rice (main ingredient), aka murmura, has carbohydrates, the sev brings in proteins and fat. Tomatoes, onions, coriander leaves and spices contain a few nutrients and antioxidants. Tamarind helps in better digestion. Some recipes use potato, raw mango pieces or mint chutney, each of these contributing their own nutrients and flavors. On the whole, bhel puri is a healthier snack option compared to many of the fried and refined snacks sold in ready-to-eat packets. Tastes yum, too!